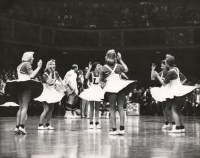 It all started in the spring of 1956 when three SLP Sophomores: Mary Ann Evans, Sara Lenmark, and Diane Burger watched a performance of the Minneapolis Roosevelt Rockettes at the State Basketball Tournament in Williams Arena. Mary Ann Evans Eckenberg recalls, "We were impressed by the Rockettes and thought a dance line would be a wonderful addition to Park’s school spirit." Diane also remembers seeing an article about a California dance group in the Sunday Magazine section of the newspaper. 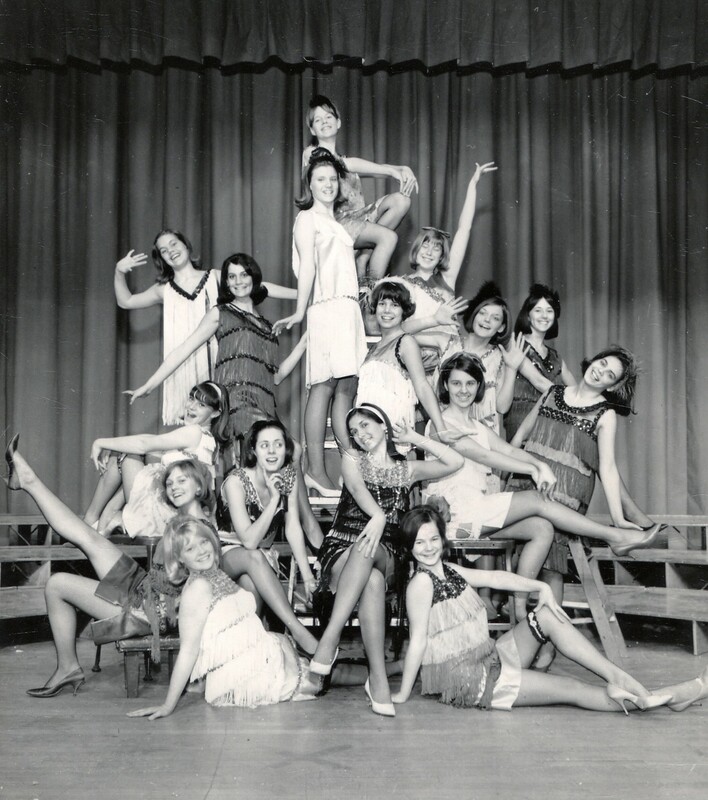 That summer, the girls approached a wonderful local dance teacher and friend of Sara's family, Mrs. Fran Libby, to present her with the idea of being the group’s choreographer. The thought appealed to Mrs. Libby and her enthusiasm took the idea forward. 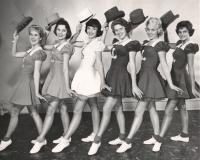 Mrs. Libby obtained the necessary permission for this new school function and began plans for the very first suburban chorus line in the Twin City area. The first tryouts were held in the fall of 1956 in the brand new band room of the brand new Senior High School. Eighteen girls were chosen for the 16 girl dance line. The group decided on a uniform of a black pleated skirt with an orange letter "P" on the side, black vest, and a baby doll sleeved white blouse. This was worn with black suede shoes and white anklets rolled down. Mrs. Marian Anderson started her many years of sewing for the girls with this costume. The girls practiced diligently twice a week in the concession area of the school. By December 7, 1956, under Mrs. Libby’s disciplined coaching, they were ready for the opening exhibition on the new St. Louis Park High School basketball court where Park played Edina. At half-time, the Parkettes performed a routine to the familiar song of "We’re Loyal to You Park High." The number began like a cheer but halfway through the routine, high kickers came in by twos, and Park High students, parents, and faculty experienced an enormous wave of pride and loyalty in their school. During the season, the group danced to such tunes as "Rock Around the Clock" and "I’m an Old Cowhand." A cowboy hat and neck scarf for the latter song provided the only uniform variation. Other activities that first year included dancing at the "Parkticipation Week" Pep Fest and the St. Louis Park Lions Club Show in the school auditorium. During the season, there was a shortage of dancers. One of the girls recalls dancing for a couple of weeks on a broken ankle. "The girls on each side of me did a great job of holding me up," she said. Basketball game halftimes were the primary performances during that initial year, and the girls danced through the District and Regional games at the Williams Arena. Thus, one year after the original idea, Mary Ann, Sarah, and Diane found themselves at Williams Arena fulfilling their dream! Up until the spring of 1957, every performance was done in the same outfit, with only the cowgirl’s scarf and hat variation, and each performance was done to the same three or four songs. But, for the school’s talent show performance, the girls had a new costume, and a change of pace - tap dancing! Attired in black leotard trimmed in black netting and pink sequins, the girls danced to "Alexander’s Rag Time Band". Thus ended the first year of the SLP Parkettes - a new school, a new chorus line, and the start of something big! One of the founders, Mary Ann Evans Eckenberg, states, "We never dreamed that it would become of such professional caliber!" At tryouts the next fall, 24 girls were chosen instead of 18, thus providing a line of 16 girls who alternated with 8 others in doing the routines. The black outfit remained the basic uniform, but a few other costumes and props were added. A big hit that year was the Charleston dress with colorful satin and long black fringe. The outfit included long beads tied in a knot, and a headband with a jewel in the center. The girls wore this costume when dancing to "Five Foot Two, Eyes of Blue" and "Button Up Your Overcoat." Flashy capes for twirling were added to the tune of "Lady of Spain." The most controversial costume was the cowgirl outfit. It was a two piece short skirt and midriff-tied top made of white satin with colorful sequins. This was the era of skirts which came down below the calf. Bikinis and miniskirts were unheard of in Minnesota, and even conservative two-piece swim suits weren’t seen on the beaches at that time. It was mentioned that Mrs. Libby received many complaints about those outfits. Many people felt there was just too much skin showing! The spring talent show, "Anchor’s Away", was opened by the group dancing to "Bell Bottom Trousers." Some Parkettes, with male partners, danced to "Around the World in 80 Days,” and the entire group later closed the show with "Twenty-Six Miles." During that number, black light was introduced with glowing white sailor hats, collars, gloves and bows on the tap shoes. In the summer of 1958, Parkettes put on an Aquatennial pre-parade show at the Parade Grounds with other chorus lines which had formed throughout the area. The girls wore a flashy black satin outfit with a large "V" neck collar decorated with shiny red sequins, gloves, a cane, and the first Parkette Top Hat! They danced to "Dark Town Strutters Ball" and later rode a red fire engine in the Aquatennial Parade. Sharon Bigalke, one of the original Parkettes the previous year, had been named Aquatennial Queen, and the girls were proud to be a part of the event with Sharon. In the fall of 1958, again 24 Parkettes were selected. That year, for the first time, successful candidates were surprised at their home in the evening by a visit from participating Parkettes in a chartered bus. This then became a Parkette tradition with the girls in later years. The third year saw a change in the official uniform and the addition of other outfits. The new uniform was a black corduroy jumper with the large orange letter “P” on the upper front, worn with a half sleeved white open-neck blouse. Variations of the uniform included colored crinoline underskirts. A new number, referred to as the “horse number” performed to the song “Don’t Fence Me In” had one girl taking the head of the horse and another bringing up the rear. A big first came the third year from the Parkettes inception – the first off-shoot from the group – the Lakerettes. Mrs. Libby chose 6 regulars plus 1 alternate to perform at the Lakers Basketball games as the Lakerettes’ Cheerleaders. 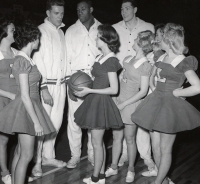 Each girl was paid $5.00 per game and they wore white corduroy jumpers with blue blouses. Practices were held four times a week at the Armory and at Mrs. Libby’s home. At Lakers halftime, the full Parkette line performed – but what a disaster! 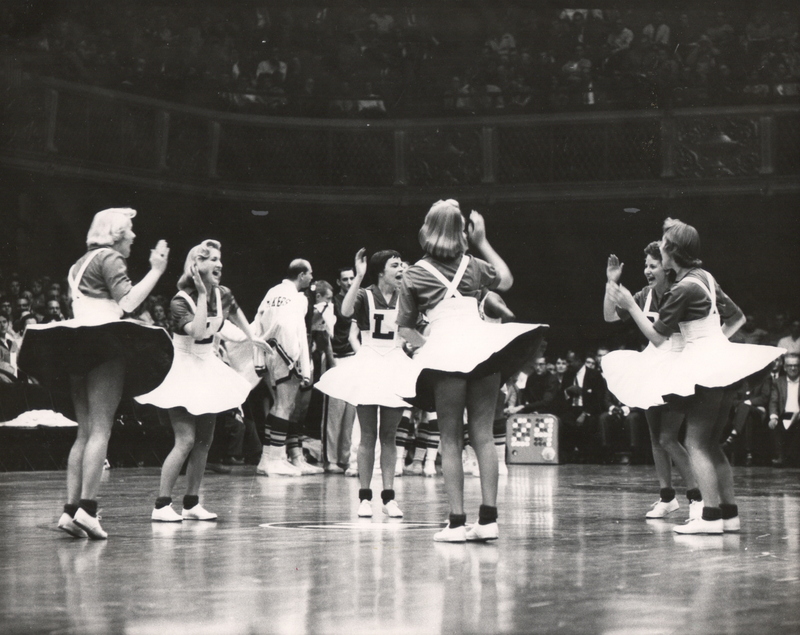 The girls recalled, “The music echoed throughout the Armory so each half of the line was dancing to a different phase of the music.” Dancing at future Lakers games went more smoothly, however, after technical problems were solved. One of the new routines introduced at this time was a number done in square dance formation. Half the girls wore their uniforms and half the girls took the male role in jeans, Dad’s baggy shirt, and a floppy straw hat. In 1960, the Parkette line remained at 24, the 6 Lakerettes and alternates continued to cheer at the Lakers games, and Chubby Checker introduced "The Twist"! The Lakerettes enjoyed an away trip to Boston on the Lakers’ private DC3 plane. "It took us 12 or 14 hours to get from Minneapolis to Boston," they recalled. There was a lot of plane trouble and a couple of unplanned stops on the way. (A few weeks later that same plane crash landed!) 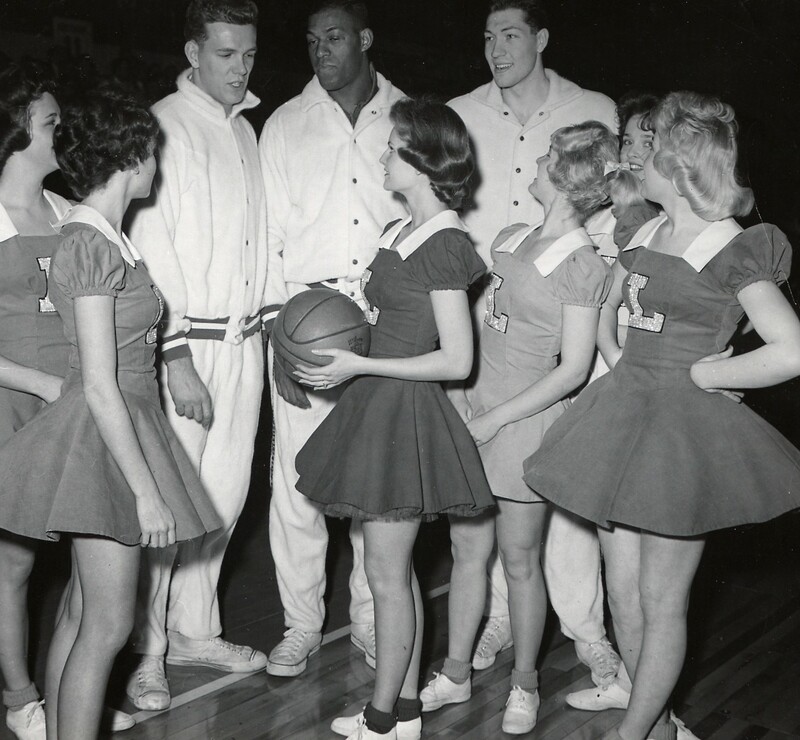 The Lakerettes became so involved in the life of the Lakers that the group had a baby shower for Elgin Baylor’s wife. For the first time since its inception, the Parkettes actually had some money coming in from their many performances. The money earned was put aside to use over spring break when all the Parkettes were invited to go on a trip to Chicago. This did, however, depend on each girl’s standing with regard to the newly initiated point system. The girls took a train to Chicago and enjoyed the time sightseeing, with no performances. 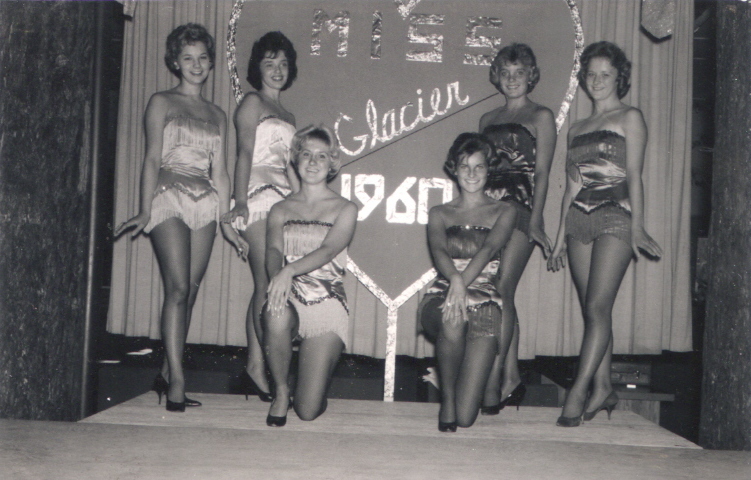 Throughout the year, the girls performed at the Auto Show, the Interlachen Country Club, the Judge Wright Show, and the St. Paul Winter Carnival, among others. For the St. Paul Winter Carnival performance, the Parkettes had two new sets of matching outfits… the girls wore colorful corduroy fur-trimmed jackets along with fur-trimmed pill box hats, and the girls who took the male role wore shirts that matched their partners’ jacket and tights on their legs. The summer of 1960 saw Parkettes riding another fire engine in the Hopkins Raspberry parade, and later some girls again made the trip to Glacier National Park with the Choraliers. 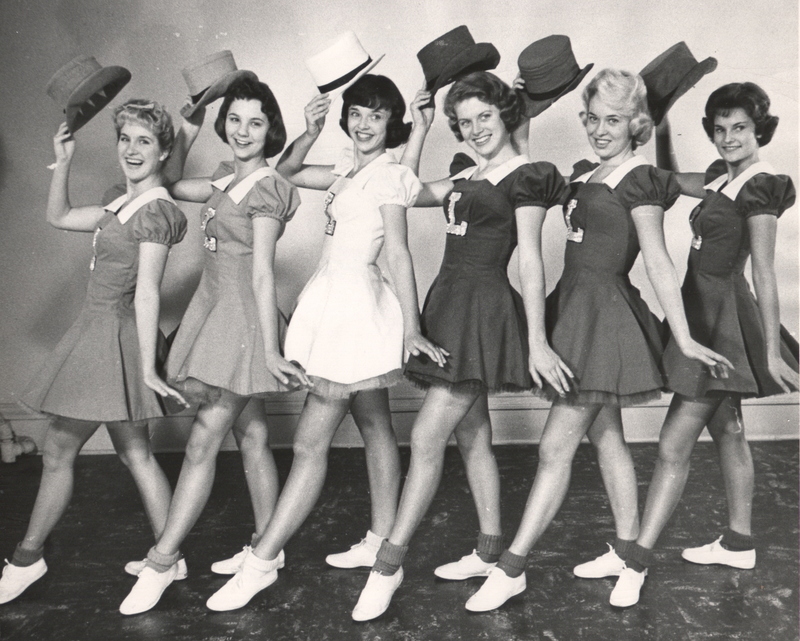 In 1961, the Parkettes were still dancing for the Lakers games, on National television and their performances were a smashing success. Unfortunately, the Lakers owner, Bob Short, packed up the team and moved it to Los Angeles after this season. 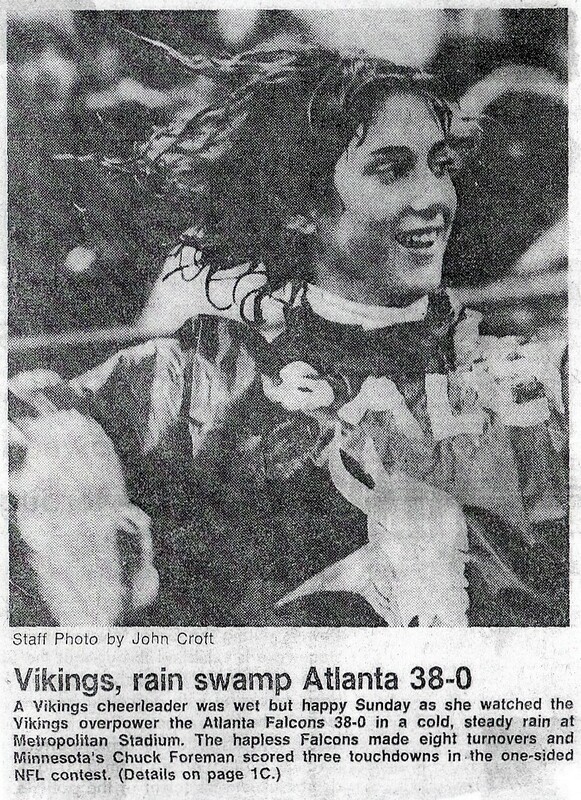 However, in the same year, the Vikings joined the NFL as an expansion team opening up what would become a new opportunity for the girls to again perform on national television in the near future. Trips to Duluth, Chicago, Washington DC, and New York followed. They danced on Ted Mack Amateur Hour to “One Step at a Time.” In 1961, Mrs. Lois Gibbs joined Mrs. Anderson in the busy life of sewing for the Parkettes, always working against the clock. Mrs. Anderson remembers many emergencies and funny incidents that happened over the years. One in which a zipper broke on one of the costumes when dressing, and she sewed the girl into her costume for the performance. We can’t thank either of them enough for their devotion to the project! Each new recruit received a gold charm that was a top hat with their name and “Parkettes” engraved on it. This was definitely one of the most exciting nights a Parkette remembers during her high school days. Still assembling in the concession area at the Senior High School, the girls were always greeted by the same figure, perched on a chair wearing a shirt-waist dress, rolled up nylons, shocking pink lipstick, chewing Black Jack gum, and wearing that damn whistle. Everyone would wait in dead silence for Her to speak. First, roll call, and if anyone forgot her dollar for that week, they would receive a 10-point demerit. Then she’d yell, “Line up.” Everyone knew her place and color. “We all looked like a bunch of hicks standing there like straight pins with our pantaloons rolled up to look like shorts and everyone wearing navy blue or maroon knee-highs with penny loafers,” one Parkette recalls. The music would start and the rehearsal would begin. She adds, "Just when we thought we were going to make it through the whole number without a mistake, Mrs. Libby would blow that ear-piercing whistle. Next you’d hear, “Now who goofed this time,” naturally, from one of the senior girls. We’d line up again and wait for that famous cue, “Take it from the top”…again and again and again. After many, many rehearsals they would finally reach close to perfection. Then it was time to squeeze into their Mary-Widows and hope that they wouldn’t bite back during the performance!" 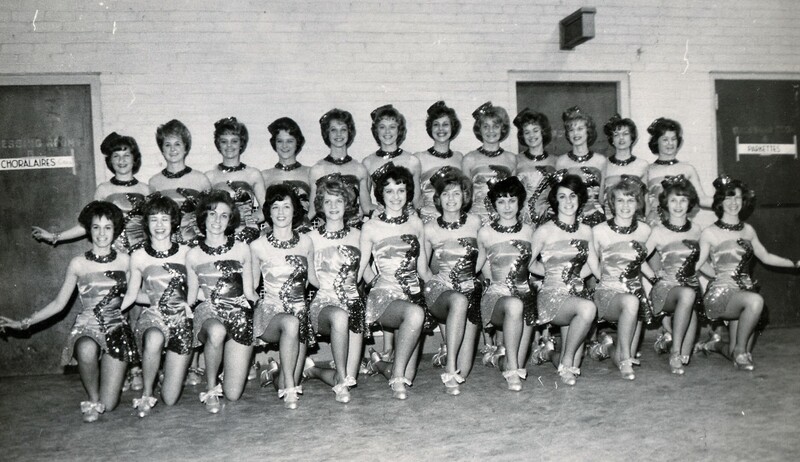 In the early years, the Parkettes performed primarily in the Twin Cities at local venues such as country clubs and city celebrations like the Winter Carnival to raise money for their trips. After all the money and points were counted up, they took off for places like California where about one-third of everyone on that trip contracted food poisoning from eating creamed turkey over mashed potatoes at the Coconut Grove. After surviving that crisis, they went on to dance at the Lakers game in Los Angeles. In 1963, the year of President Kennedy’s assassination and Martin Luther King’s "I Have a Dream" speech, the Parkettes were bound for New Orleans and Florida. One of the Parkettes remembers, "On the way down, we fought for the floor of the Greyhound bus to sleep on." They also suffered from too much sun too quickly and paid the penalty! Cindy Pratt Solovskoy recalls having a hard time getting into costumes - ouch! One of the girls burned the bottoms of her feet and couldn’t wear shoes. They danced with the Frankie Avalon show at the Fontainebleau in Miami - the highlight of the trip! The Parkettes also performed at the Midwest Hootenanny Festival in September of 1963. The group then consisted of 30 girls. In the fall of 1964 some of the Parkettes from the previous year had to try out again because of the strict “point system" instituted by Mrs. Libby. If a Parkette was late, sick, or forgot a part of their costume they would receive demerits. When a Parkette reached twenty-five demerits, they were required to try out again. It all paid off in the end, though. 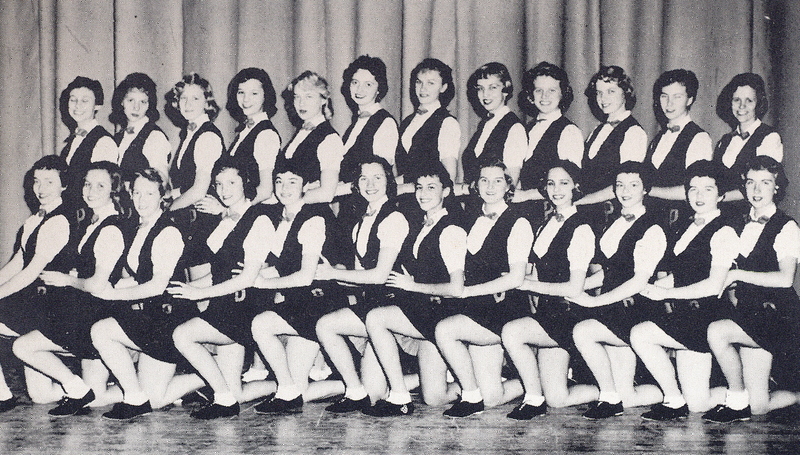 The year was devoted to more rehearsals and performances, but the Parkettes were also instrumental in starting a new dance line at Southwest High School known as the Indianettes. 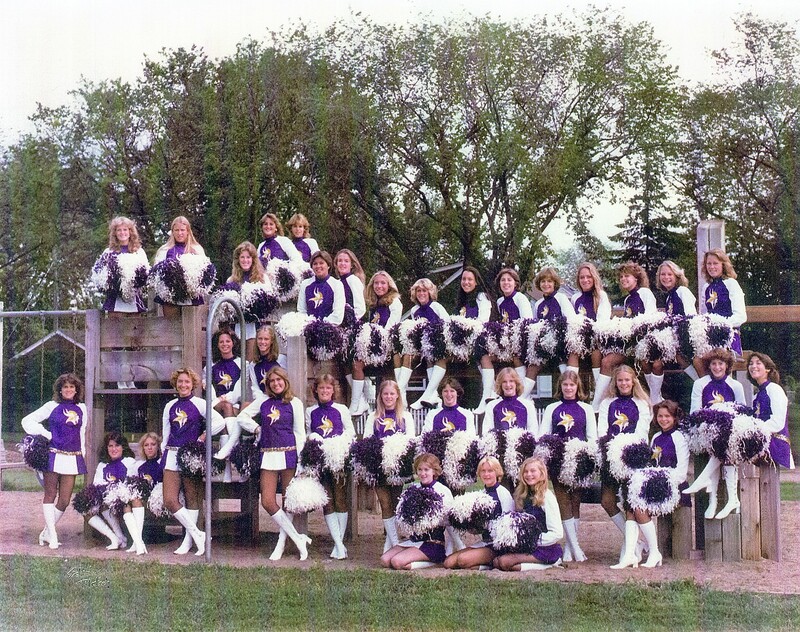 This was also the year the Parkettes were asked to be the official Vikings Cheerleaders, they created the Park Petites, a younger version of themselves, and also formed the Parkette Fan Club. The Fan Club was comprised of parents and relatives of the Parkettes. The formation of this group enabled the Parkettes to charter a plane for an upcoming trip to Europe. On June 9th, they all boarded Trans-Canada Airlines and nine hours later landed in London, England. They danced for BBC Television and had an engagement at the Club La Roco on the French Riviera. A few of the junior girls recalled sneaking out after their 10:00 p.m. curfew to escape to a local place American servicemen frequented in Heidelberg, Germany. They drank boots of beer as they were passed around a long wooden table and sang German beer songs. Cindy Pratt Solovskoy says "The soldiers had a great time, and we giggled all the way back to the hotel - we never got caught!" Since wine drinking in Europe is very much a part of the culture, the girls were allowed to drink wine if they had a note from their parents. Unfortunately, one unnamed Parkette had a bit too much on the train ride to Milan and got very sick out the window. Even worse, because of the suction at the window, it all came back in on the girls! Nancee Sholtec Wright adds "We even drank champagne at the Moulin Rouge in Paris and saw a seminude show - Wow!" All agreed that the 1964 trip to Europe was "a blast"! In 1965, the year the Vietnam War escalation began with the deployment of 150,000 US troops, Malcolm X’s assassination in Harlem, and the Rolling Stones hit #1 with "Satisfaction", the Parkettes traveled to Aspen for the Colorado Rotary International at the Broadmoor. Governor Love even came back stage! One of their stops was the Air Force Academy in Colorado Springs. They all got "fixed-up" with a Cadet and went to a big dance especially planned for them. The Cadets were all dressed in their dress blues. Cindy Pratt Solovskoy notes that "Some of the girls did better than others on that fix-up. My date sent cards for a while, but there was always the boy back home that most of us had left." In late summer, the Parkettes took the train to Chicago to appear on the "Ted Mack Amateur Hour". All the people back home were proud to see their school represented by the Parkettes on national TV. A side note: the Parkettes were mistakenly known as the "Parakeets" in various parts of the country! In 1966, with The Mamas and Papas and The Monkees topping the charts, and the first airing of the TV show "Mission Impossible," the Parkettes and Fan Club worked to earn money to pay for the girls to accept the invitation to dance at the Rose Bowl in California. The Parkettes entertained for the coronation of the Queen of Roses with none other than ol’ "A one an’ a two an’ a three" himself - Lawrence Welk! The girls also danced the entire length of the Rose Bowl parade route, wearing out the bottom of their fish-net hose right through their white go-go boots. Senior night out was to have dinner and catch the latest sensations, Sonny and Cher, who were quite the rage that year. In the spring of 1967, it was off to "Aloha Land", beautiful Hawaii. The girls danced at Tripler Hospital for the boys just back from Vietnam. Then off to Scofield Barracks where another show was performed in the Roaring 20’s costume with the long strands of swinging beads. A few high kicks and the girls found themselves with heels tangled in the bright beads. But somehow things were unsnarled, and in good Parkette tradition, they barely missed a beat. The return down the mountain with Honolulu and Waikiki bathed in silver moonlight was a sight not soon forgotten. The Parkettes' group night was held at the International Marketplace located across from their hotel, The Moana Hotel. It included dinner and getting up on stage with Don Ho when he sang "Tiny Bubbles." Joy Mattocks Rishavy says "We were so enamored with Don Ho that we kept singing the song the rest of the trip." Rabbit, their surfing coach, was made an honorary Parkette during their stay. Many remember the tears as the bus headed for the airport and singing "Tiny Bubbles" with the bus driver. Due to an Air Traffic Controller strike, their flight, scheduled to leave at noon on Sunday, did not arrive to pick them up until Monday morning. After a very busy summer teaching the Park Petites and the fall and winter cheering the Vikings to the NFC Central Division Championship, the girls were off again to Europe. This was a real financial challenge. To raise money they had tennis court dances, rummage sales, candy sales, doughnut sales, tasting program appointments, inventories at Target, and of course, much dancing, along with cheering at the Viking games. During the 21-day tour of Europe, the Parkettes visited Holland, Amsterdam, England, France, Germany, Switzerland, and Italy. While in Paris, the Parkettes exchanged “know-how” with the majorettes of that city. During a luncheon in Switzerland on Easter Day, much to their horror, they were served rabbit. At dinner they were entertained by Swiss music and some of the girls even entered the yodeling contest. Next, they were off to Germany to give two performances for the G.I.s stationed there. The servicemen were so appreciative that the Parkettes were invited to the Officers’ Club for a show and a night of dancing. Not one girl sat out one dance! This was one trip that made the front page of the Stars and Stripes and the St. Louis Park Dispatch. Will anyone ever forget the Polka-Dot Bikini? It caused quite a stir back home. In Venice, there was a group dinner at Alfredo’s, a lovely old-world restaurant, where the Parkettes were served Fettuccini Alfredo by the proprietor, Alfredo. Little did they know at the time that Alfredo was the originator of that famous sauce and they were lucky enough to be served by the man, himself! For those who were art lovers, Venice and Florence were astounding, seeing all of the beautiful architecture, Plaza San Marco, and artwork, such as the David, by Michelangelo. Rome was the final stop with tours to the Trevi Fountain, the Spanish Steps, Coliseum, Sistine Chapel, and Vatican City before we boarded the plane back to Minnesota. After a busy year of performances and Vikings games, the Parkettes were off to Spain and Africa for their spring trip. The first 15 hours of the trip were spent in the Minneapolis airport with tire problems. When they were almost ready to take off, there was some apprehension when the pilot was observed kicking the tires. He should have kicked a little harder because as the plane was taxiing out to the runway, there were not one, but two blowouts. They sat in the plane out on the runway waiting for the equipment to be flown in from New York! This even unnerved the brave Parkettes, to say nothing of the adults on board, and the story not only made the local newspapers, but the TV news as well. Once everybody arrived in Spain, however, all was forgotten and the trip proved to be fabulous. Trips to Granada, Mijas, Gibraltar, and Tangiers were not dampened by the rain, rain, rain. Shopping was so great that everyone boarded the plane with package upon package. A passport was packed in a suitcase which was loaded into the belly of the plane. Guess what that meant! Yes, the plane was unloaded and the suitcase unpacked to find the passport. Then, and only then, were they allowed to fly out of Spain. What an exciting trip. This was the year that the Parkettes and Fan Club Members, totaling 500, filled two planes. The beginning of the fall football season with Bud Grant and the Purple People Eaters was an exciting time. The Vikings, having only been in existence since 1961, won the Western Conference Championship game at the Met Stadium on December 27th. On January 4th, 1970, the Vikings win the NFL Championship game which qualifies them to go to their first Super Bowl. 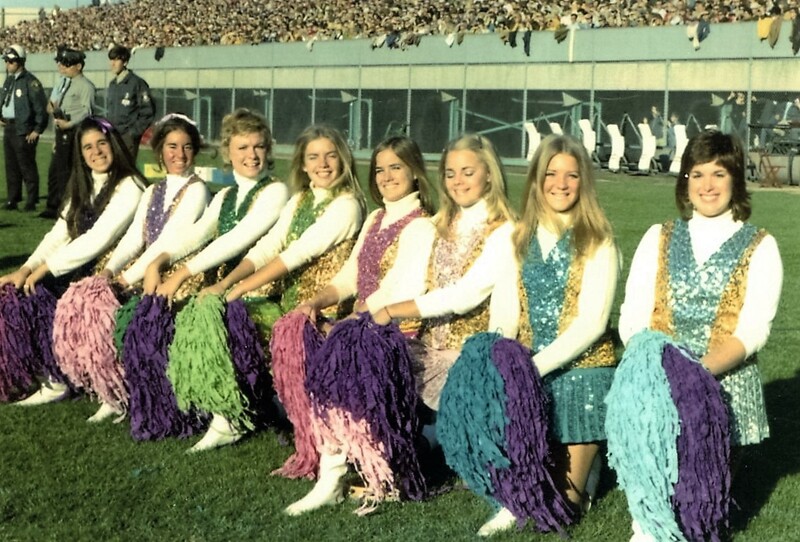 The Parkettes were invited by the team to perform at Super Bowl IV on January 11th, 1970. After 33 hours of traveling in a bus to get to New Orleans for the game, the Vikings lost to the Kansas City Chiefs, 23 – 17. As if losing the game wasn’t upsetting enough, the Parkettes had to face another 33 hours on that bus to get back to Minneapolis! For spring break, once again there were Parkettes on the beach of Waikiki. The girls revisited Tripler Hospital and danced for the injured G.I.s. There was a special show put on in the Banyan Court of the Moana Hotel for Mr. & Mrs. Max Winter of the Minnesota Vikings (he was truly impressed by the Vikings girls), and another production at the Hilton Hotel. Once again celebrities were in our midst, namely, Mannix and his wife, Michael Cole from “Mod Squad,” and the world’s largest Japanese wrestler – truly a Neanderthal man! It was on Sunday evening that they received the news of the passing of Mrs. Fran Libby, their director. She was a strong woman, who demanded perfection and discipline from everyone. However, she also instilled a strong sense of loyalty, responsibility, honesty, pride in themselves and their school, and a strong bond of affection for one another. She was an amazing woman who gave the girls a great gift that they would benefit from for the rest of our lives. 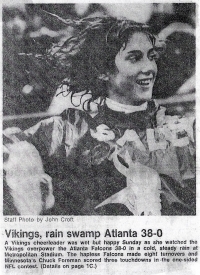 Fortunately, a former Parkette, Carol Wexler, was able to step in and guide and rehearse the girls over the succeeding months until a professional choreographer could be found – the Parkettes were in the beginning stages of their annual half time show for the Vikings and were training several hundred younger Park Petites – a Herculean annual undertaking to say the least. The choreographer chosen by the Parents Board was Mrs. Robert (Toni) Swiggum, a pert, tiny wisp of energy who could pass for one of the Parkettes herself. Toni Swiggum continued to teach and direct the Parkettes through the mid 1980's and so in two decades the group had only two professional choreographers from outside their own ranks. The year of 1971 took the Parkettes to Mexico. The first stop was historic Mexico City, with all of its beautiful parks and extraordinary fountains. The car and bus drivers were something else! They should have left the driving to somebody else... the trip by bus from Mexico City to their favorite little mountain city of Taxco was horrendous. It was there they met the owner of a silver shop who had spent most of his life in Mankato, Minnesota! Back in Mexico City – they toured the city, the University, Chapultepec Park, The National Museum and everyone attended the Ballet Folkloric which was gorgeous! Also, a visit to the Pyramids meant climbing to the top and crawling down to the bottom. After the wild bus ride from Mexico City through Cuernavaca and on to Taxco, Parkettes could be found buying silver jewelry in every single silver shop. Then on to Acapulco, where the girls enjoyed a trip around the Bay, seeing the cliff divers and dancing at Las Brisas for children from a local orphanage. In 1972, Tarkenton returned to the Vikings after a five-year absence, “Pong” introduced the video craze, and the TV shows, “The Waltons” and “Mash,” began their long runs. Leaving the snow and cold behind, off the Parkettes went to warm Caracas, Venezuela, carrying a vaccination certificate and an ID card. Little did they know at that point that the Venezuelan government had decided they might not let the plane land. A few strings were pulled and they ended up at the Sheraton Macuto Resort, the most expensive hotel in the world, located on a sandy beach, near the port town of La Guairá, with the sweep of the Caribbean Sea on one side and the impressive backdrop of the Avila Mountains on the other. The performance took place in the movie theater of the hotel and people were packed to the rafters. The entire group was thrilled with the visit to the races, the tour of the city, the breathtaking ride over the mountain by cable car, and a visit to the German mountain village of Colonial Tovar. Does anyone remember the visit we got from the Three Musketeers from Caracas? After five days in Caracas, they were off to the Dutch Island of Curacao, a fairyland of Hans Christian Anderson with pastel shop fronts. The sun was glorious and the drying hot winds were constant. The steel drum band playing pool-side every day, the floating bridge and the huge Russian luxury liners passing in the night all made for unforgettable memories. This was also the first of the “Wiggins Award,” named after Kathy Wiggins and her flying splits. 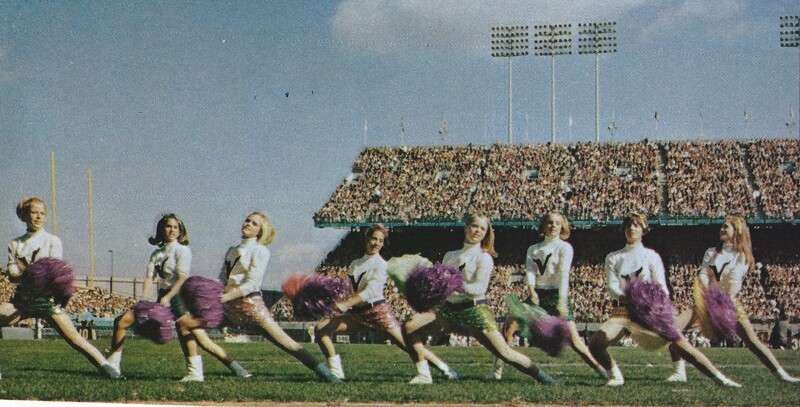 In the fall of 1972, the Parkettes were invited to Green Bay with the Vikings to cheer and dance to “Consider Yourself” during the half-time show of the game. During the remainder of the year, until the spring trip, the Parkettes were seen performing at various venues, including several parades. March of 1973 brought about another Hawaii trip for the Parkettes. This time the girls initially stayed in Hilo, Hawaii, at the Waiakea Village Resort, performing at the hotel during their stay, and being entertained by the Polynesian Review from the Polynesian Village. Since Hilo is a small town just below the rain forests, the weather was rainy until they traveled to Honolulu to stay at the Moana Hotel in Waikiki Beach, a Parkette favorite over the years and one of the original three hotels on the island of Oahu. There they went sightseeing to Pearl Harbor and Diamond Head. 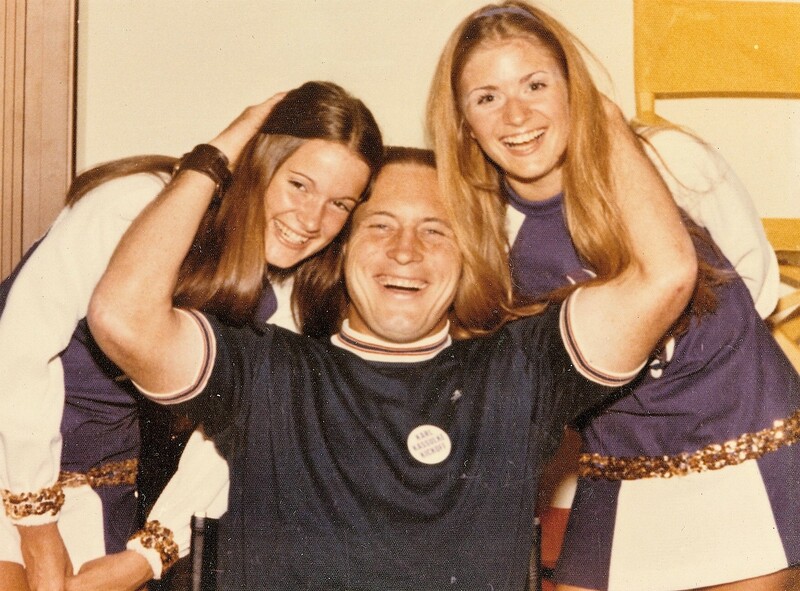 In January of 1974, the Vikings invited the Parkettes to attend the Houston Super Bowl Game. The Parkettes’ own chartered aircraft landed behind Frank Sinatra’s private jet. Twelve limousines rolled up to meet him and his party. Then, the Parkettes’ school bus, and Toni and Bob Swiggum in the hotel van, rumbled up to the Parkettes’ plane. Remember the Happy Buddha? Everything (except the score: Dolphins 24, Vikings 7) was first class. Jeff Wright of the Vikings attended our annual party in February. Jamaica was the destination of the March, 1974, trip. The Parkettes, led by a British-type boy’s band paraded through town. All the natives joined in the parade. OH, the sequins on sunburns! The native children screamed and cheered throughout “Soft Shoe.” The entire performance was exciting. After a full year of performances at Vikings games and various celebrations around the city, it was time for the annual February party at Toni Swiggum’s house. This time, the party featured Ron Yary who presented the Parkettes with a plaque of appreciation. The spring trip took the Parkettes to Panama where they performed at the Balboa Theatre following a showing of “Comancheros” starring John Wayne. They stayed at the El Panama Hotel which had been billed as a four-star hotel, but it was under construction and there was no pool. They ended up taking turns going to a local pool by bus. On a side trip to the San Blas Islands, the Parkettes flew to a small island and then were to be picked up by a smaller plane to complete the journey. They waited and waited but no plane showed up. They were waiting in an area with picnic tables and an overhang - no buildings, no people, and no facilities. After some time, some pigmies with machetes came out of the surrounding jungle. They spoke little or no English, but the tour guide managed to communicate that the group was waiting for a plane that had not come. They somehow communicated that they could take us to the San Blas Islands and proceeded to lead us through the jungle to a small stream. The tour guide, Fella, decided to send the parents first and they were loaded into a hollowed out log canoe and headed off. While the girls were waiting for someone to return for them, the pilots found the remaining group and were very upset that the parents had been sent out into the ocean with the pigmies. It was discovered the reason the pilots were late was because some dignitary was landing at the airport and no planes were allowed to take off during that time. The Parkettes went with the pilots and they sent out a rescue crew for the parents. The parents were eventually found, but it sounded like they had quite an ordeal. The San Blas islands were very interesting - no photos allowed without permission - they believed a piece of their soul would be taken. They made "molas" - beautiful fabric artwork. We were also guests on a boat that went through the Panama Canal - it was quite a party! As it turned out, several Presidents of South American countries were also staying at the hotel so the Parkettes weren't allowed to take the elevators for security reasons. Even though the pool was closed at the Hotel El Panama and each day they had to walk up four flights of stairs to get to their rooms, the excitement of having the presidents of Costa Rica, Panama, Columbia, and Venezuela at the hotel made up for everything. The performance in Balbo was a wonderful experience, and the casinos a unique treat. The Panama Canal Company had a party onboard their ship to which the Parkettes were invited. The dinner was delicious, the band fabulous, and everyone danced the night away – what great hosts! The train ride to Colon and back, the entire day spent on Tobago Island, and the side trip to San Blas (the home of the Cuna Indians) were all very exciting. Though there were challenges… the group that was stranded in the jungle and tried to ask directions from munchkins with machetes, and a small plane load of seniors which hit a bird at 5,000 feet and began their descent very rapidly causing quite a scare, then leveling off and landing safely… the trip was a huge success. 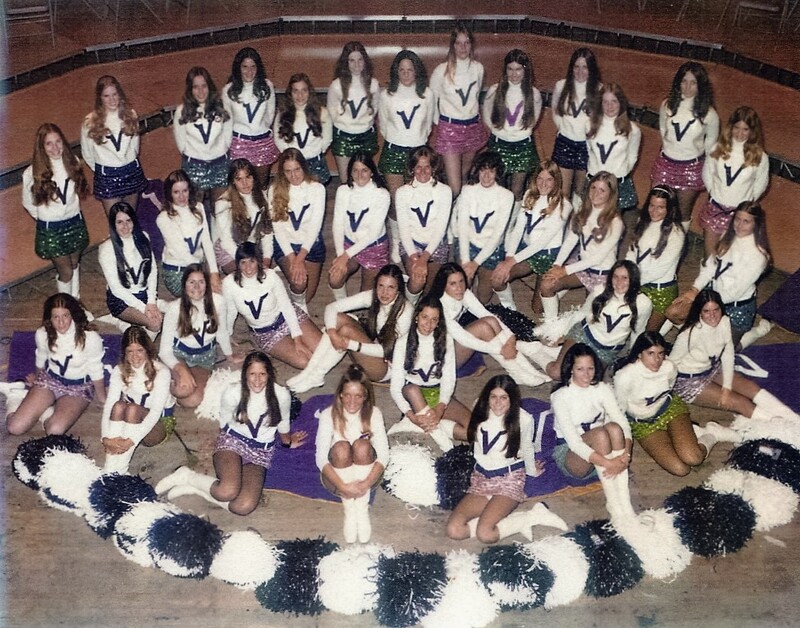 In 1976, the Parkettes cheered at Memorial Stadium for the North-South Shrine All-Star High School Football game. They also provided the half-time entertainment for the Vikings-Jaycee Basketball Benefit in February of that year, in addition to the yearly parades in the summer and regular Vikings half-time shows with the Park Petites. 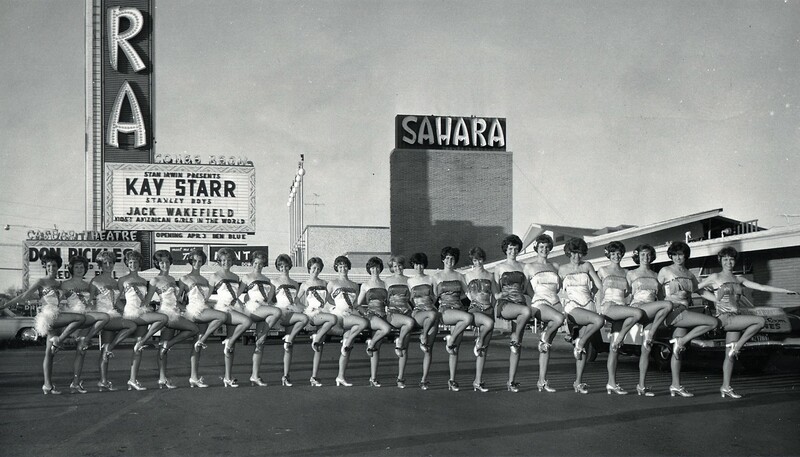 Later that year, the Parkettes were invited to dance on the stage of the legendary Cooper Theater, for the invitational preview of MGM’s new movie, “That’s Entertainment, Part 2”. This was also the year of the Parkettes’ 20-year reunion at the Ambassador Hotel. Dancers from 1956 to present congregated in Minneapolis to celebrate the Parkette experience. As always, Toni Swiggum had her year-end party, with Ed White as the Viking guest celebrity. Then, the group left for their spring trip traveling to Freeport, Bahamas where they enjoyed the steel drum bands that played by the pool. 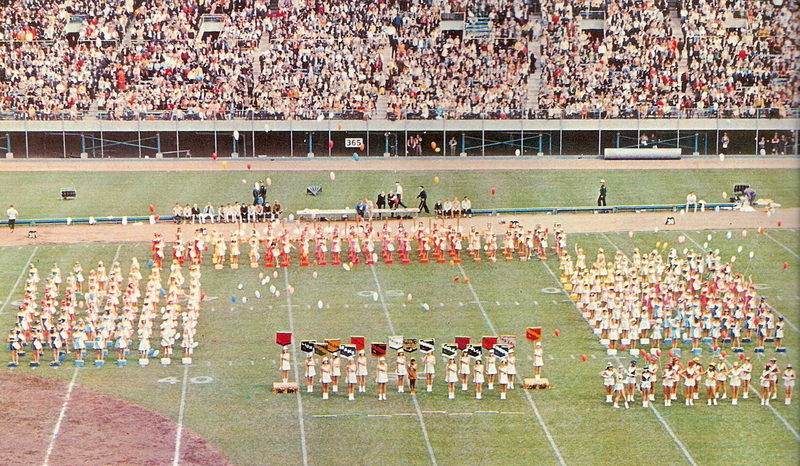 The 1977 season started with summer parade performances around the metro area. The Parkettes were honored to be the Grand Champions of the Hopkins Raspberry Festival parade that year. They danced with the Park Petites during halftime at the Viking pre-game show in August. In October, they danced with the Dan Cavitz orchestra at a United Way of Minneapolis event, attended by Max Winter and other corporate and sports heavyweights. The Vikings made it to the Super Bowl that January against the Oakland Raiders. Navigating the Rose Bowl stadium was tricky, in that the sidelines were filled with films canisters, and there was very little room to cheer. The Parkettes did have a celebrity “photo op” with singer Vickie Carr though. 1977 was a time when disco was becoming very popular and so too were the Dallas Cowgirls. Let's just say the scantily clad Raiderette cheerleaders received more camera time than the Parkettes did. However, since the Super Bowl was in Pasadena, California, the Parkettes wholesome image was probably instrumental in being asked to dance in the Disneyland parade and attend a private lunch on the Reuben E. Lee ferry. The annual party at Toni’s house was fun, and as always, bittersweet. The year was coming to an end and it was time to pass the baton to the juniors by electing unit leaders, assistants, parade leader, and big boss. The Viking guest that year at Toni’s party was Autry Beamon (another “photo op”). The grand finale to the year is always the spring trip and the choice that year was Mazatlán, Mexico. The ladies spent a lot of time in the sun around the pool at Don El Guia‘s, they also went parasailing, ate at Senor Frog’s, and performed for an orphanage. They may not have loved their horse or gumdrop costumes, but the children certainly did! Everyone wanted to experience the Mexican culture so a trip to the bullfights was planned. They were so excited for the sport and pageantry of the event. Unfortunately, most of the group spent the afternoon crying, with their faces buried in their hands. The blood and brutality of the sport was definitely a shock. The Senior Farewell is an event put on by the juniors during the last days of the spring trip. It signifies the official end to the year for the seniors. It’s a special time for laughing, singing, and reflecting on the three years each senior has spent with the Parkettes before they must rotate out and start preparing for their futures and college. The summer started with the Cooper Theater movie premiere of “A Bridge Too Far” starring Robert Redford and Sean Connery. The Parkettes were asked to hostess and dance at the big event. Redford was a no-show but meeting Sean Connery was definitely a thrill. There are some words and phrases that spark the memory of every Parkette, no matter how many years have passed… A bunny suit - not zipped up, talking time, prop boxes, guide! (shouted loudly by some senior), “sophomores bring the treats!” singing “Tiny Bubbles” on the bus, weigh-ins, putting on mesh tights over sun burned legs during trip show performances, silver shoes, basics, avoiding horse poop while marching in parades, teaching Park petites in the hot summer sun, “One Step At A Time,” black jumpers, gigantic purple and white pom-poms, water-bowl-door-scissors-scissors (remember that move? ), state fair band shell, “Spanish Flea” and who can forget POINTS OFF! Then there are the memories that are unique to the class of 1978. As sophomores, they were yelled at and received as many points off as all sophomore classes who came before them. They still managed to enjoy their first year and shared some incredible experiences. Who could forget ending our season in Freeport, Bahamas? 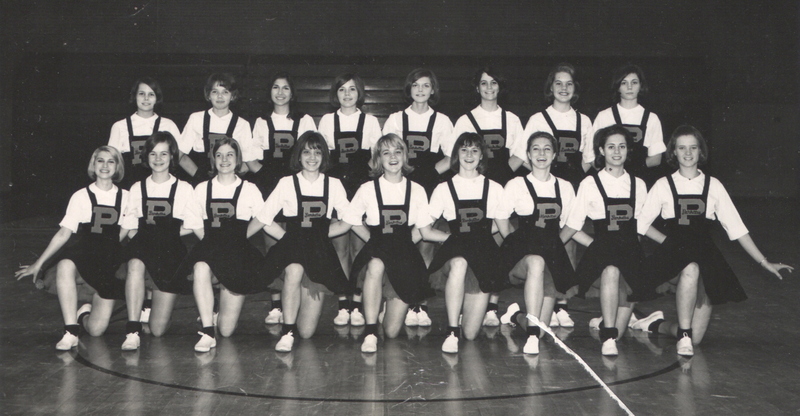 In addition to the usual parades, state fair performances, cheering for the Vikings and dancing at halftime, the Parkettes also had a great time cheering and dancing at the boys’ state basketball tournament that year and were also featured in a National Car Rental ad. The highlight of the season had to be the trip to Hawaii at the end of the season. They performed poolside for the hotel guests and the Parkette families, spent the days soaking up the sun while most of the nights were spent in the Waikiki discos. The Beach Boys happened to be in concert the same week and Toni chaperoned a big group to the concert and they all had a wonderful time. For the senior dinner, they were treated to a wonderful meal in an exclusive restaurant. Michael Landon was seated right across from them and they spent most of the evening waving at him and trying to get the nerve to stop at his table to say hello. They finally did, and he was very sweet to them. During this year, the senior class was invited to Heron, South Dakota, to judge a statewide cheerleading competition. They all had a great time, judged the competition and headed home in their 9-person van. During the drive back, it started to snow and eventually became a blizzard. They ended up getting stuck in the snow out in the middle of nowhere. Terri Murphy and the hired van driver left the vehicle and found a farm house. The farmer came and got the van out of the ditch of snow and took them back to their house. It was decided that it was too risky to travel and they ended up staying at the farm until morning, when they piled back into the van and completed their journey. Fortunately, they had lots of brownies, cookies, and junk treats to sustain them through the ordeal. The class of 1981 did everything in a big way. The senior class was 18 strong, which was a larger group of seniors than was traditional. Despite the size, everyone formed close friendships and had fun in everything that they did. Graduating that year with the group was Director Toni Swiggum’s daughter, Pam Swiggum. The summer brought performances in parades and preparing 200 Park Petites for their performance at a Vikings game. During the school year, the group performed at the Met Stadium for the Vikings and during halftime at school basketball games. The annual trip was to the beautiful island of Oahu where the Parkettes performed at the Waikiki Mall. It was quite a site to see everyone running between the temporary dressing room in JC Penney to the stage in the middle of the mall. Two seniors, Leah Carls and Elisa Tallakson, participated in the Battle of the NFL Cheerleaders. They were outstanding representatives and held their own against the competition. In 1983, the Parkettes were still very active performing at various parades throughout the summer months. The Park Petite program was attended by many would-be dancers which culminated in a performance at the Viking season opener. Thankfully the Vikings now played inside the Metrodome, which got the Parkettes out of the cold. The Parkette parents sold programs for the Vikings and raised most of the money needed for the annual spring break trip. 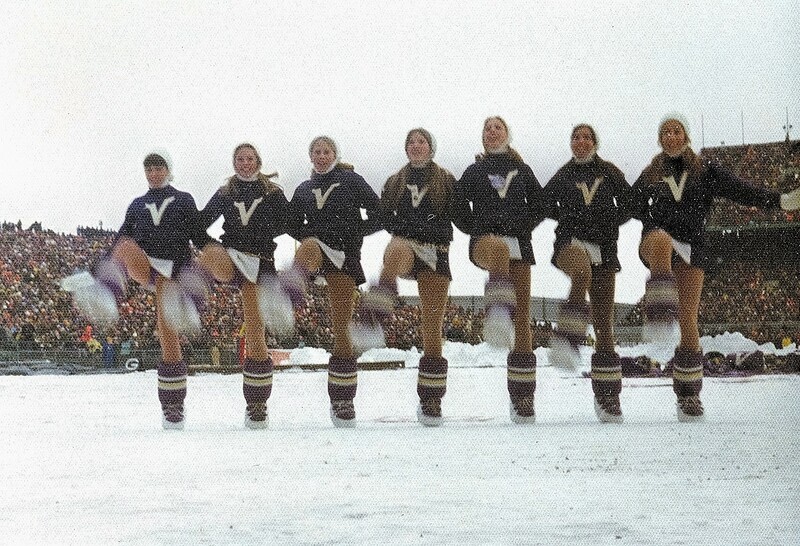 Over the summer of 1984, the Vikings organization decided to go for an older more mature look and ended the Parkette reign as cheerleaders and half time entertainers. The Parkettes continued with their summer parades and the Park Petite program had its last year. The group continued performing for the St. Louis Park High School basketball and football program. In 1984, the Parkettes performed on the cruise ship, Song of America, as part of that vacation. In 1985, Lisa Passolt was picked to be the new choreographer. Lisa was energetic and brought new life to the organization. During her tenure, the group flourished but was stopped short by a complicated pregnancy which put Lisa on bed rest. The group continued to self-led over the winter and prepare for its performance in Puerto Vallarta that spring. With additional funding, the group was able to take their planned trip to Mazatlán where they performed for an orphanage. A few months before the spring trip the Board decided that the group would not go to Mexico, but go on another cruise, where they performed onboard the ship.